Before and after the Helsinki summit the internet was awash with searches related to “Trump” and “Treason”…even more so than when Trump joked in July 2016 about Russia having Hillary’s missing 30,000 emails. The Duran’s Alex Christoforou and Editor-in-Chief Alexander Mercouris discuss the out of control ‘Russia did it’ narrative that is consuming mainstream media news and triggering the DC swamp…but to the working American, focusing on life’s everyday problems, Russia hysteria barely makes the list of “most important problems facing” America today. 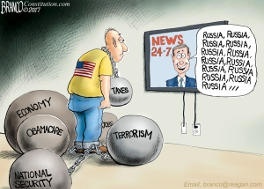 According to Zerohedge, as with the Democrats’ unending focus on Russia and the media’s constant collusion chatter: few Americans care, because – drumroll – they have real lives in the real economy to worry about. “The meddling was on the margin, and the Democrats need to accept this. The collusion – they haven’t found one shred of evidence. This can’t be so?, CNN tell us Russia is the number 1 issue in America…………LOL. China, China, China: The other Holy Trinity that Deepstate really fears. Hey The Duran, analyze this: The West is arguably considered loser of the Syrian War. Or is it colluding with Putin to put it on the back burner, humming for a couple decades until it finds another theater?